Listen closely and watch up. On May 22, 2017 there was a terrorist suicide bombing at Manchester Area after an Ariana Grande concert had finished. 22 people died in this attack while many others were injured and everyone was forever changed, including myself. While Manchester is almost four thousand miles from where I am in Minneapolis, it felt like it was in the next city over. As a person who used to go to concerts all the time growing up and finding them to be a place to forget about the real world and just enjoy this moment, it breaks my heart that an arena concert was targeted. Especially one filled with young people and family members. The United Kingdom has always held a special place in my heart and even though I’ve never visited Manchester, I have been to London and feel connected to the U.K. through music and my love for the great country. So when I saw that Grande was planning to put on a benefit concert, less than two weeks after the terrorist attack at her show, I was impressed and admired her determination to fight back in a way that we all connect: through music. The One Love Manchester benefit concert featured artists/bands such as: Ariana Grande, Marcus Mumford, Take That, Miley Cyrus, Pharrel Williams, Little Mix, Black Eyed Peas, Katy Perry, Cold Play, Justin Bieber,and Manchester’s own, Liam Gallagher. Before watching this, I wasn’t a huge fan of Grande’s music or really her. I have seen her performance once and I will say, she is an amazing singer and talented. I found her awkward when speaking to the audience, but after One Love Manchester, I see her in a whole new light. She is a performer who really, genuinely loves her fans. You can see it when she talks to the crowd, how she approaches the other performers and even going out of her way to go to the hospital where people who were injured in the attack were being treated. I respect Grande a lot for giving back as much as she possibly could for a situation that had nothing to do with her. It was an unfortunate event that her concert was targeted but she is taking responsibility and doing what she can, including paying for the funerals of all those lost in the attack. Performers stand on a different platform than say someone working a cubicle kind of job – aka me – in that they are in the spot light. They have more opportunity to reach millions of people and voice their opinions on important causes and try to make a difference. This is one of those instances where Grande took her fame and had her voice be heard all around the world. One Love Manchester is one of the most watched TV events of 2017 with 10.9 million viewers. 50,000 people attended the event and raised $2.6 million. Now, this isn’t the first benefit concert to come together for a great cause. 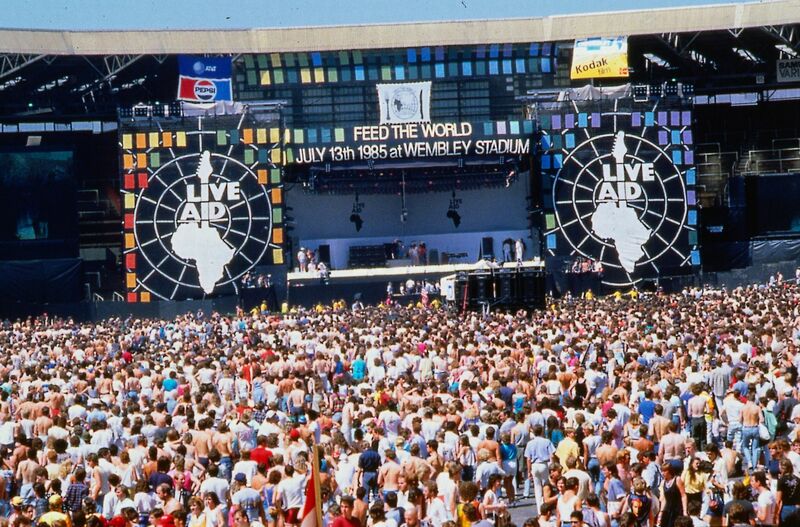 One of the most well known is Live Aid that took place in both London and Philadelphia to raise money for Ethiopian famine. Over 65 performers, from Freddie Mercury/Queen, Madonna, U2, Mick Jagger, Bob Dylan, David Bowie, Simple Minds and many more, performing. A combined 172,000 people attended at the arenas with a global audience of 1.9 billion across 150 nations who watched the live broadcast of the benefit. This event was a follow up to the successful charity single “Do They Know It’s Christmas?” – which is a family classic in my household. I will say, whenever I think of the Live Aid benefit, I always think of Queen’s performance at Wembley Stadium in London. This is regarded as their greatest live performance, even though they were unenthusiastic about performing at the benefit. Just watching Mercury perform though, makes me feel like I am there and experiencing the energy he put on at events. This is how I know him and think of him. These are just some examples of the impacts performers have on the world. They bring people of all kinds together in one space and a connection grows from that. The audience connecting with the performer; with other people; with the world. Music is something that affects us in different ways but there’s no denying that it brings us together in times of need. The Manchester Arena attack is one of three attacks the U.K. has faced in the past year. London was the most recent city that was under attack and my thoughts are with that beautiful city. To watch the full benefit concert, click here. For some of my favorite songs by my favorite U.K. singers, click here. Stay safe U.K. Stay strong.